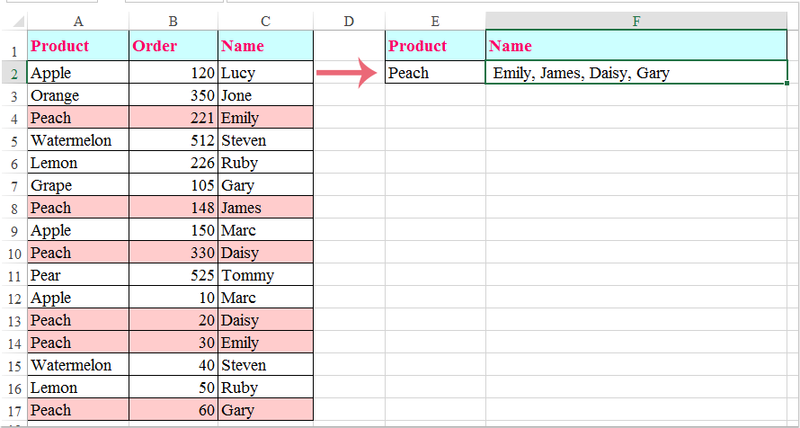 Comment vlookup et retourner plusieurs valeurs sans doublons dans Excel? Parfois, vous pouvez vlookup et retourner plusieurs valeurs correspondantes dans une seule cellule à la fois. Mais, si certaines valeurs répétées sont remplies dans les cellules renvoyées, comment pouvez-vous ignorer les doublons et conserver uniquement les valeurs uniques lorsque vous renvoyez toutes les valeurs correspondantes comme suit capture d'écran affichée dans Excel? xStr = xStr & xDic.Keys(i) & ","
Note: Dans la formule ci-dessus, E2 est le critère que vous voulez vlookup, A2: C17 est la plage de données que vous souhaitez utiliser, le nombre 3 est le numéro de colonne qui contient les valeurs renvoyées. However, this is taking a long time to process from a large set of data. Is there any alternative method to process this faster? xStr = xStr & xDic.Keys(I) & "," to be this: xStr = xStr & xDic.Keys(I) & ", "
Is there a way to replace "," with in-cell ALT+ENTER, so that the results will be in the same cell but on different lines? Do I need to introduce additional VBA module for that and combine them? Also, this code is quite slow when looping over huge tables. Anyone knows any faster solutions? And then do with the above steps in this article, at last, after entering the formula, you should click Wrap Text under the Home tab. Is there a way to add a space in between the multiple values retrieved in the results without introducing a comma at the end of the list? 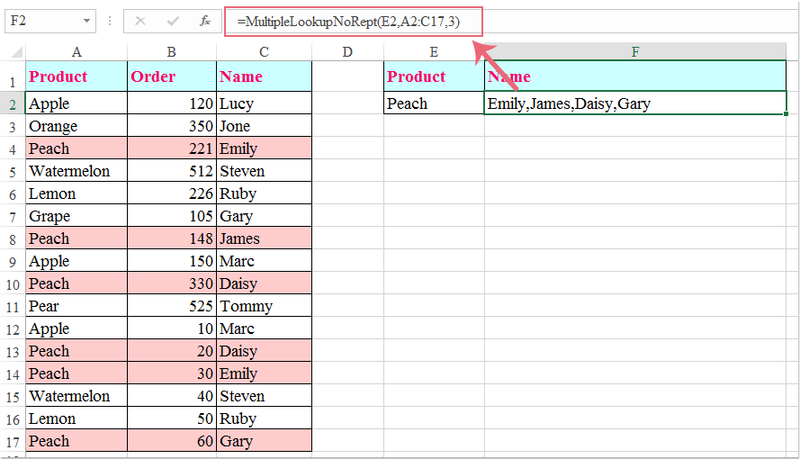 For example your result above would show as: "Emily, James, Daisy, Gary" instead of like this: "Emily,James,Daisy,Gary"
I tried to edit this portion of the VBA code: xStr = xStr & xDic.Keys(I) & "," to be this: xStr = xStr & xDic.Keys(I) & ", "
That did add the space in between the values, but it also added a comma after the last value. "Emily, James, Daisy, Gary,"
Is there a way to make it work with the space but without the extra comma after the last value? from xStr = xStr & xDic.Keys(i) & "," to be this: xStr = xStr & xDic.Keys(i) & " "
what if I wanted to create a list in a table from this instead of all results in one cell? Thank you very much for this formula. This works for me. However, it is taking a long time to process from a large set of data. Can we modify this formula to work this bit faster?